Samurai Defender: Ninja Warfare for the Nintendo Switch is an action strategy game from Japanese developer Flyhigh Works. It’s actually more like a tower defence game, featuring marching samurai warriors relentlessly attacking your castle. With few games in this genre on the Switch, does Samurai Defender successfully bridge the gap, or leave a void? As with any tower defence game, your main goal is to protect yourself from an oncoming onslaught. In this game, you guard your castle on the left of the screen while waves of enemies attack from the right. Atop your castle sits a lone archer, and you control his aim using the touchscreen or JoyCon controls. He fires relentlessly in the same direction until you guide his aim elsewhere, so you’ll have to watch for sneaky foes. Once they reach your castle gates, they’ll start attacking until your HP is depleted. The game starts off easily, which is a relief because the tutorial system leaves a lot to be desired. There are some helpful hints on screen while each stage loads, but these disappear before you have a chance to absorb them. Although the game does increase in difficulty soon enough, thankfully you have unlimited lives. Plus, you’ll still earn rewards despite losing a stage. Given its mobile origins, it’s no surprise that this game works well with the Switch’s touch screen. You can easily control the aim of your arrows with a simple tap of the screen. It also suits the portable nature of the Switch, with bite-sized stages to pass the shortest bus trip or the longest train ride home. The game works just as well while docked on the big screen, but I found it more enjoyable on the go. Speaking of stages, there’s an endless supply of these, ready to keep you occupied for a very long time. There’s a chance you’ll tire of the sheer relentless slew of enemies attempting takeover, but the game does vary enough in design and difficulty to keep you coming back for more. To keep things interesting, there’s a strong tactical element to the game. Each time you play, you earn experience points. Leveling-up unlocks more characters to purchase, including sword-wielding soldiers, carpenters, or knife-throwing ninjas. These backup characters can be called during a stage using magic, and become essential during harder stages. The tactical side of things involves knowing when and where to deploy these soldiers. You can only bring three into any stage with you, and they do drain your magic, so timing is important. Playing also earns you copper. This is traded for upgrades to your building’s HP, or the number of archers you control. You can also upgrade their speed and magic power, and it’s fun saving up your hard-earned coins for more powerful upgrades. 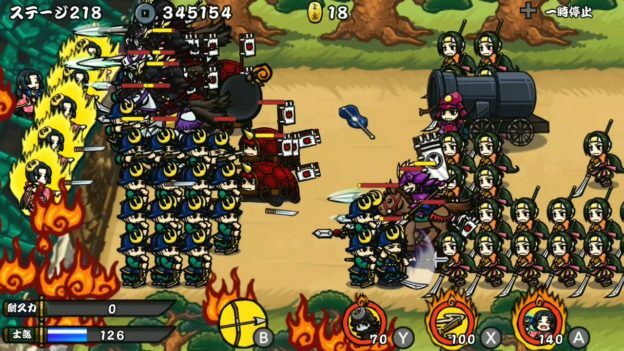 The graphics give the game a cartoony vibe, with cute-looking Japanese warriors wearing scowls on their faces. 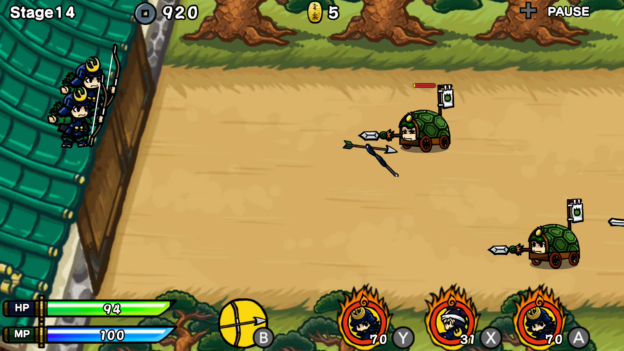 The enemies vary, with some wielding spears, others swords or arrows. Each differs in their garb too, with some hiding in shell-like tanks, which are harder to penetrate. The music matches this aesthetic well, with Japanese-inspired music using classic instruments. The tunes are catchy and fast-paced during stages, enough to keep your blood pumping during those stressful moments. It fits the tense mood nicely. 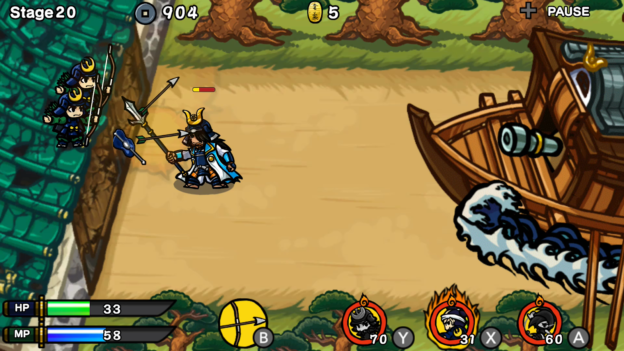 Overall, Samurai Defender is a neat tower defence game. It presents a simple yet addictive concept involving Japanese warriors with the ability to upgrade basically everything. With hundreds of levels to conquer, this game has the potential to keep you busy for hours. If you’re a fan of the genre, I’d recommend giving this one a try. Samurai Defender is a neat tower defence game, with a simple yet addictive concept involving Japanese warriors attacking your castle. There’s plenty to upgrade, with hundreds of levels to conquer, giving this game the potential to keep you busy for hours. If you’re a fan of the genre, I’d recommend giving this one a try.